I know I said I would be back with an apple recipe, but I made this Turkey Pot Pie last night for dinner and we all agreed that it must go on the blog today so you all can try it with your leftovers tonight. I am so thankful I snapped a quick instagram shot of my daughter’s pie before we dug in! What has been your favorite way to use up Turkey Day leftovers? 1. Heat a large skillet on medium heat. Warm the olive oil until just before smoking. Add onion, celery, garlic and carrots. Saute until “al dente”, about 7-8 minutes. 2. Add turkey, peas, and corn. Stir for a minute then add the soup, water and gravy and stir until completely combined. Simmer on Med-Low heat while you preheat the oven to 350 F and prepare the pie crust. 3. Roll out pie crust. Place small spoonfuls of potatoes, yams, and cranberry sauce all over the bottom of a casserole dish or individual ramekins. Fill with turkey mixture but leave a little space for the pie crust on top and for bubbling over. An inch should be plenty. Top with pie crust. Press crust around the edges to seal and remove the extra crust. Brush pie crust with a stirred egg yolk. Bake on a cookie sheet for 25-30 minutes until the pie crust is golden. Cool for a few minutes before serving. I made turkey enchiladas. Wrap turkey, some cheese, canned green chilis, and sour cream in flour tortillas. Top with salsa verde, cottage cheese, cream of chicken soup, and more cheese. Bake until hot and the cheese is melted. If you want more of a recipe, let me know. I do have it somewhere. Hey! 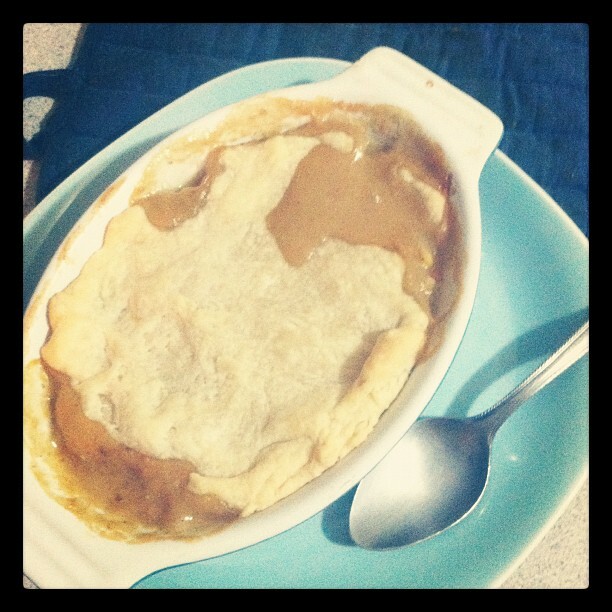 We did that, too, this year…..turkey pot pie, that is. I’m “practicing” with American Food these days. When you say “pie crust” is that one you made or bought? I wasn’t thrilled with my homemade one this year, but pot pie covers a lot of shortcomings 🙂 with all it’s goodness. It is beyond beautiful! I only wish my pictures could do it justice! So happy to hear your Thanksgiving went well! Melissa, I just received your box of cookies for the Great Food Blogger Cookie Swap. How fabulous are those shortbread!?! I liked your suggestion to make them into sandwiches, but they disappeared before we could try them that way. I’ll have to make a batch of my own. Ironically enough, my go-to appetizer is a savory pistachio shortbread–very different in flavor. Sooo happy you liked them!